"We've received seventeen crates from ChiLo. We'll hit stores the same day we sign the license agreement." The obvious place to try this is in NEH Astrobiotics, where it can rez a SanSan City Grid for free. You could switch the 2x Breaking News for two of these. I think it will end up being worse; the ability to just score a 2/1 with no fast-advance resources is strong. And it's not clear when scoring a License Acquisition is good. Late game you probably don't need another SanSan, and early game you would rather just score an Astro. Since a few years have passed since this card was last reviewed, and I have never done a review before on this site, I'm going to put in my amateur 2 cents. The highlights of this card are obvious: Asset/Upgrade freebies. It's primary purpose would be to pop out a SanSan without the hit to the credit pool, but in reality, this card can be used to bring out anything, for the same reason. Obviously, the bigger the card, the better your value out of it. That's huge. Got a runner making a mess of R&D? License Acquisition. Want to recur one of your trash-cost Assets/Upgrades? License Acquisition. Want your Jackson Howard- Well, it won't help Howard, but it's still a strong ability. The big rub to all this though is that it's a 3/1. Not terrible, but also sort of awkward. 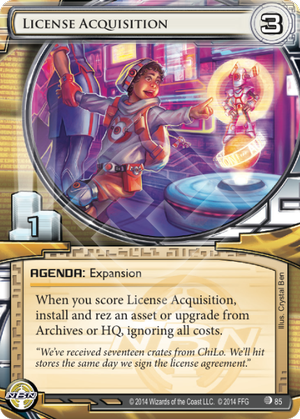 As implied by a "License Acquisition" this card wants a plan. It wants a combo. You don't throw this out to score it. This is a card that you throw down with the future in mind. To break even, you need something worth more than a full turn spent just to install and rez something. Now, if this card were an operation, or any other kind of card, it would be an auto-include, I feel, but because it's an Agenda it's a Risk-Reward play, and there's a lot of risk in NBN as is. License Acquisition isn't for everyone, but if you have a plan for it, I feel it can pay itself back.